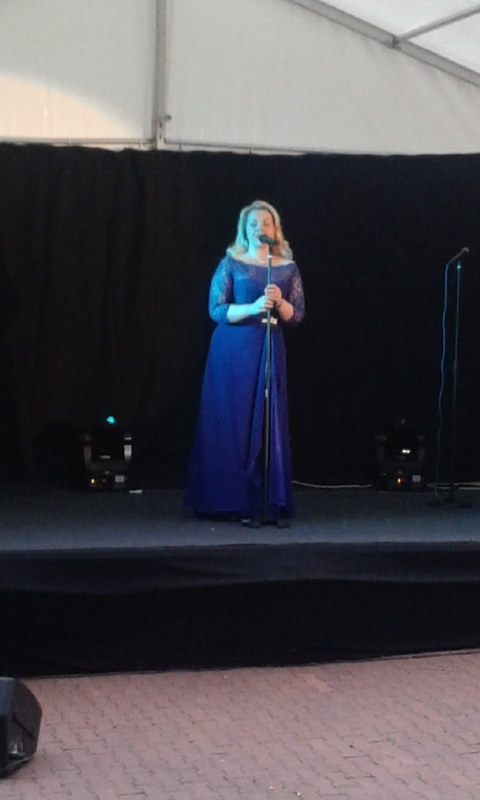 People’s soprano Rebecca Newman has expressed a soft spot for Hull in an interview at The Minerva pub on the Marina as she prepared to take part in the first Opera on the Marina event and outlined some future plans too. Speaking first of her recent experience touring with international superstar Russell Watson she said the tour “Absolutely everything, and more,” that she had hoped it would be. Despite an incredible schedule over several months there is still no let up for this incredibly hardworking lady for at least a few weeks yet as she promotes her forthcoming show in Lichfield and a programme she’ll be doing on BBC Radio 2 with Sir Terry Wogan. “I’m hoping come the 20th July I might get a couple of days off and maybe switch my phone off,” She says with a little giggle. Moving onto her appearance at Opera on the Marina as the headline act she explains it’s fantastic to be back in Hull and, as much as she loved being on tour with Russell Watson, it was going to be nice to be able to do some more on stage and show her full repertoire. She then explains about future events, “I’ve got a new booking agent so we’re looking the next year ahead and there will be a tour next Spring so it’s likely there’ll be a tour date in Hull then. This entirely enchanting lady then continues to say that they’re looking at some slightly different options but it’s probably going to be a similar project to Dare to Dream with crowd funding so everybody can feel part of the creation of the album again. We then start talking about the incredible support of the Newmaneer’s who follow her in massive numbers and who she has an incredibly close relationship with wherever she goes, “They’re amazing, they support me by buying tickets to performances like this one this evening and buying CD’s, that’s important. “But also they’re important to me because I don’t think they realise how much they keep me going when I have a low day, when I’m tired you know, when some of my equipment’s broken and I’ve got to get the car fixed and when you hit the normal challenges. “People only see the successes and things when they’re right because I tell people about them but when something goes right a hundred things go wrong and I keep plowing on regardless and it’s the wonderful support that I receive that keeps me going in many, many ways. The next question while all around us is a hive of activity is if there’s anybody else in particular she would like to sing with to put on the list next to the likes of Russell Watson and Aled Jones who she’s already worked with which draws a very definite response with a little cheeky glint in the eyes. “Oh absolutely, Alfie Boe wants to sing with me but we haven’t been able to sort that out yet, he keeps asking me ‘When are we going to sing together?’ But, when I can I will be there with bells on, but he’s got a management company to work with so it’s not always as simple as that but I would love to get the opportunity to sing with Alfie. Getting onto the subject of favourite venues places like the Royal Albert Hall are inevitably mentioned but she clearly also enjoys a nice intimate venue and the tour with Russell Watson has obviously provided her with chances to sing in some venues that she has really enjoyed although some do seem to have blended together. And with that the interview was ended as she has to go and prepare for what turned out to be a fantastic show on Hull Marina, we can only hope that she is back in her second home sooner rather than later. The session about Martin Bell was an acute lesson in how to deliver war reports and then how to completely change direction in life because of what you have seen. He started his career with the BBC in 1962 before being called to London in 1965 shortly before his first foreign trip for them to Ghana. Learning about his career it has become very apparent that he covered many wars and conflicts, 11 in total, and has reported from 80 different countries. In his reports from Bosnia he has a sense of urgency in his voice and he isn’t afraid of reporting from the side of troops and the side of civilians as well. There are times he does a piece to camera with either troops and guns or with civilians around him which I find truly extraordinary. It is well documented he then used his Bosnian experiences to great effect as he announced his candidacy and then overturned a huge Tory majority in the seat of Tatton in the 1997 General Election. His success in the election made him a symbol of the fight against sleaze in the Conservative government after he had been a symbol of war reporting. His reflection on his time as a war correspondent to a packed out audience at The Frontline Club is very insightful.